We all know that a healthy breakfast is the most important meal of the day. It gives us the fuel we need to get off to a good start. But, let’s face it, who has time to even eat breakfast these days, much less take the time to prepare a healthy meal? Be that as it may, we all need to set aside 15 to 30 minutes in the morning to enjoy a healthy breakfast. That means we need to find quick and easy meals to make so we can have our healthy breakfast and eat it, too. Breakfast provides the energy that allows the body to function optimally throughout the day. That is why we need to pay attention to this important meal. We know from our own experience that if we skip breakfast, we are probably starving when lunch time rolls around. And, in many cases, we overeat. We also know that overeating leads to obesity, and obesity leads to all sorts of health issues. These include cardiovascular disease, diabetes, and others. We do not want to go down that path, especially since it’s avoidable. Now the 15 to 30 minutes we need to take the time to eat breakfast isn’t looking like an obstacle we can blow off. Let’s discuss some healthy breakfast ideas we can incorporate into our daily routine. Egg white omelets are healthy options for heart health and weight management. Each yolk in a large egg has 4.5 grams of fat and 1.6 grams of saturated fat. They also have cholesterol which egg whites do not. So if cholesterol is a concern, egg white omelets are the way to go. But, the yolk does have essential fatty acids. According to the American Heart Association healthy adults can safely eat one whole egg per day. It really depends on the goals of your diet whether you would include the yolk or not. Egg whites have only 17 calories and no fat. They also contain most of the egg’s protein, about 4 grams of protein in 1 large egg along with other essential nutrients. Egg white omelets can include various proteins, such as lean turkey slices, ham, turkey sausage, or even turkey bacon. You can also add cheese and a wide variety of vegetables, such as, tomatoes, onions, peppers, mushrooms, and even fresh garlic. The possibilities are endless. These delicious and hearty breakfast meals are full of protein to provide lots of energy for the day ahead. Oatmeal makes a wonderful breakfast. Oats are whole grains that offer a high fiber and protein filled start to your day. You can perk it up by adding fresh fruit for some sweetness. How about some delicious buckwheat pancakes? Buckwheat is a whole grain that is much healthier than white flour. It is also much less fattening and loaded with nutrients. Since it is low in carbs it has much less impact on blood sugars. You’re less likely to experience those spikes that cause you to crash and burn half way through a busy day. One 5” buckwheat pancake has 71 calories, 2.55 grams of fat, 9.71 grams of carbs, and 2.71 grams of protein. Skip the syrup and top with fresh fruit such as strawberries. Another healthy breakfast idea is a whole grain bagel. Spread with cream cheese and serve with fresh fruit. On those days when you have a little more time, why not make yourself a breakfast smoothie? With a breakfast smoothie, you are eating more than just one type of fruit. You can even include vegetables and other natural ingredients. Give your body all the nutrients it needs in the morning with a variety of healthy breakfast smoothie recipes that are quick and easy to make. This breakfast is filling and the nutrients give you long lasting energy. You are, therefore, less likely to overeat throughout the day. Okay, since we’re on a roll, let’s add a few more to this list of quick and easy breakfast ideas. How about a bowl of yogurt, granola, and fruits? Greek yogurt is generally hailed as the healthiest of the lot, but you still need to read the label. Again, it has added sugar. The same is true with granola. Buy the healthiest granola you can find, preferably one that contains nuts. 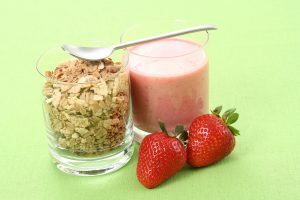 The combination of yogurt, granola, and fruit is delicious, and you can use a variety of fruits to change things up. Remember that omelet we mentioned at the beginning? Well, how about putting it between 2 slices of whole grain toast! Or, even a bagel. Turn it into a breakfast sandwich; you can even add a slice of tomato and a piece of cheese. That will get your engine running. And, when all else fails and you really need to run out of the house, grab a piece of fruit on your way out the door. While it isn’t providing the nutrients you need to start your day, at least it’s something until you can eat a proper meal. By eating a healthy breakfast and starting off on the right foot, you’re more likely to make healthier food choices throughout the day. And when you make healthy choices your body will reward you by doing its job properly.